In other news, reporting rules will change for Maine lobstermen and another condo project is planned for Portland's Franklin Street. The days of turning in your old, worn-out Bean boots to L.L. Bean for a brand new pair are officially over. 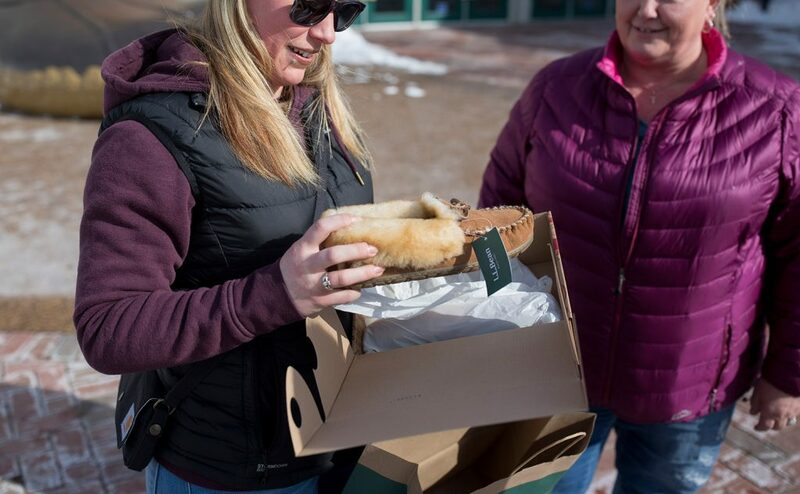 In a reversal of its longstanding policy, the Freeport-based outdoor retailer will no longer accept returns on any product it has ever sold regardless of the item’s age or condition. L.L. Bean executives said the decision was prompted by a growing number of customers abusing its generous satisfaction guarantee policy. In the past, L.L. Bean would accept almost any return in exchange for a new unit of the same product, the most comparable product currently available, or a store gift card valued at the last known sale price of the returned item. But from now on, products only can be returned if they were purchased within the previous 12 months or have a manufacturing defect, they said. The retailer also has implemented a new proof-of-purchase requirement. L.L. Bean’s computer systems contain transaction records going back four years, so a receipt isn’t necessary unless the item to be returned is more than four years old, the executives said. Read the story. Maine lobstermen will have to start giving up their most treasured fishing secrets, including where they set their traps and how much they catch, in five years. Starting in 2023, the Atlantic States Marine Fisheries Commission will require all lobster fishermen to submit detailed reports on their fishing activities, including those in Maine, the nation’s lobster capital, where current regulations only require 10 percent of licensed lobstermen to share their fishing data. In other states, lobster fishermen have been submitting reports on every trip for years. Fisheries managers say this data is necessary to assess the health of the Gulf of Maine lobster stock and understand the economic impact of other ocean projects, such as deep-sea coral protections or wind farms, on the valuable lobster fishery. In Maine, which lands 83 percent of the nation’s lobsters, the industry caught more than 130 million pounds of lobster valued at $533.1 million in 2016. Read the story. The class-action lawsuit against Oakhurst Dairy that led to a memorable ruling highlighting the virtues of the Oxford comma has been settled for $5 million. The suit, filed in 2014, alleged that drivers for Oakhurst were eligible for overtime pay that they never received. The dairy argued that the wording of a state law meant the drivers weren’t eligible for overtime pay. A lower court ruled that the law exempted the drivers from overtime because they were involved in the shipment and distribution of the products. The lack of a comma between “shipment” and “or distribution of” meant both phrases referred back to “packing for” – as in “packing for shipment or packing for distribution.” Because the drivers deliver the products but don’t pack them, the company argued they weren’t covered by the Maine exemption to overtime pay. About 127 drivers are covered by the settlement, in which Oakhurst admitted no wrongdoing. Read the story. Hancock Lumber of Casco said Monday that it has acquired Mainely Trusses, a roof and floor truss manufacturer based in Fairfield. The acquisition will add a new product line to Hancock’s manufacturing portfolio, the company said. The addition of Mainely Trusses makes Hancock Lumber the first retailer in Maine to own and operate its own roof and floor truss manufacturing facility, the company said in a news release. Terms of the acquisition were not disclosed. Read the story. Auto, home insurance rates remain among lowest in U.S.
Insurance rates for autos and homes in Maine rank among the lowest in the nation, the state’s Bureau of Insurance said. Maine consumers pay less for auto and home insurance than consumers in nearly every other state, said Superintendent Eric A. Cioppa, because of its competitive market. Cioppa said Maine has ranked third nationally for lowest average auto insurance premiums for five consecutive years and 10th nationally for lower average homeowners premiums for three consecutive years. Read the story. Falmouth-based software developer Home Care Business Services Inc. has received $225,000 from the National Science Foundation to develop an application that helps hospitals reduce costly Medicare patient readmissions. The company’s founder, Melissa Cott, said the software her team is developing has the potential to save U.S. taxpayers billions of dollars. The NSF grant is in support of a Medicare program known as hospital readmission reduction. Cott’s application is intended to reduce the number of Medicare patients who are discharged prematurely from hospitals only to be readmitted within 30 days. The software she is developing is expected to analyze all the factors indicating the likelihood of a patient’s need for readmission and boil them down into a simple score of 1 to 100. Read the story. A six-story, 31-unit luxury condominium building is being proposed along Franklin Street in Portland, continuing a high-end housing boom that is reshaping the city’s East End. The $13 million project at 56 Hampshire St. is being proposed by Chip Newell’s NewHeight Group, which recently completed the neighboring Luminato Condominiums, a six-story, 24-unit development that was completed and sold out in 2017. Newell said the new building will have a different design than the Luminato, primarily by including some decks along Franklin Street and adding brick to the facade. Developers hope to have the “Verdante at Lincoln Park” ready for occupancy by the summer of 2019, according to its website. Read the story. The summer home of the late billionaire philanthropist David Rockefeller on Maine’s Mount Desert Island has sold for $19 million. The real estate company that handled the sale declined on Thursday to identify the buyer, who paid the asking price. A limited-liability corporation assumed ownership at the closing on Feb. 2. Money from the sale will be used to help fulfill bequests in Rockefeller’s will. Rockefeller left $20 million to the Land and Garden Preserve of Mount Desert Island in Seal Harbor and $5 million to the Maine Coast Heritage Trust. Read the story. Weary commuters will have to wait four more months before they can start using the Sarah Mildred Long Bridge between Portsmouth and Kittery. The lift-span bridge is now set to open to traffic in mid-May, eight months after cars were supposed to start using it to cross the Piscataqua River on the Maine-New Hampshire border, according to an updated construction schedule from Cianbro, the Pittsfield-based company hired by the state of Maine to build the bridge. Cianbro spokesman Alan Grover did not respond to an interview request Tuesday to explain the delay. Cianbro started construction on the $160 million bridge in 2015 to replace an aging lift span. It is one of the most expensive bridge construction projects in state history. The old bridge was closed permanently in August 2016 after the lift span became stuck in the upright position. It was demolished two months later. Read the story. Portland-based ImmuCell Corp. increased its revenue in 2017, but product development costs resulted in a small net loss after the company had a profitable year in 2016, according to preliminary financial results issued Thursday. ImmuCell, which develops and produces bovine health products for the beef and dairy industries, had $10.4 million in sales revenue in 2017, a 9 percent increase from the $9.5 million in sales the previous year, the company said. ImmuCell had a net loss in 2017 of $168,000, or 3 cents per share, compared with net income of $508,000, or 12 cents per share, in 2016, it said. Product development costs contributed to the net loss in 2017, the company said. ImmuCell spent over $2 million on product development in 2017, compared with about $1.2 million the previous year. Read the story.